Having worked for many years in retail and now not, I can’t tell you how much I appreciate weekends. Those 2 days to be free from the school run/ pack lunches/ errands and general must do things. Don’t get me wrong it isn’t chore free, i am an adult and a mum full time so its never completely restful, but it is nice to go at a somewhat slower pace. The other thing i love about weekends is dressing in comfy casual clothes. 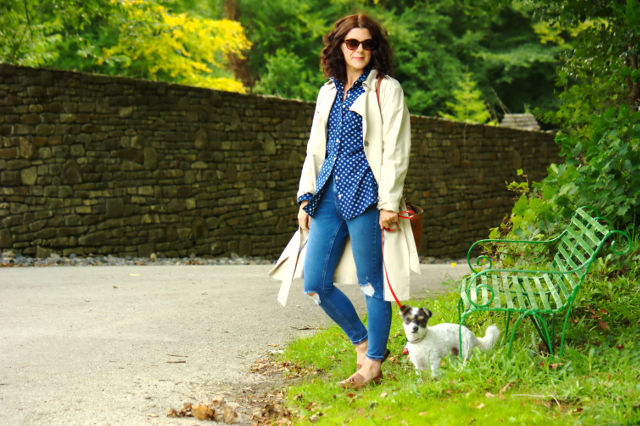 I have a couple of Autumn weekend essentials that I love to wear. Thye are effortless but make me feel and hopefully look, pulled together, when really not much effort was taken. Thats the best look wouldn’t you agree? Effortless yet still together. A trench coat just makes you look and feel like a boss without even trying hard. They really are the perfect light weight for this time of year and go with pretty much any outfit: Over a dress, skirt and blouse, knitwear or jeans and a shirt, you’re instantly sorted. Its a winner all round , all year round for me, but particularity great for Autumnal weekends. Mine is thanks to Ocean Credit Cards who asked me to pick out a piece for Autumn.. I Instantly knew a trench was just the thing and that I will get a tremendous amount of wear from it. A shirt that makes you feel Fantastic (with a capital F). Yep.. This shirt is just slouchy, yet chic all at the same time. Gant aim to be the ultimate shirt maker so you expect a good shirt right? Well they do not disappoint. Having practised the art of fine shirt making I think it’s fair to say they’ve mastered it. 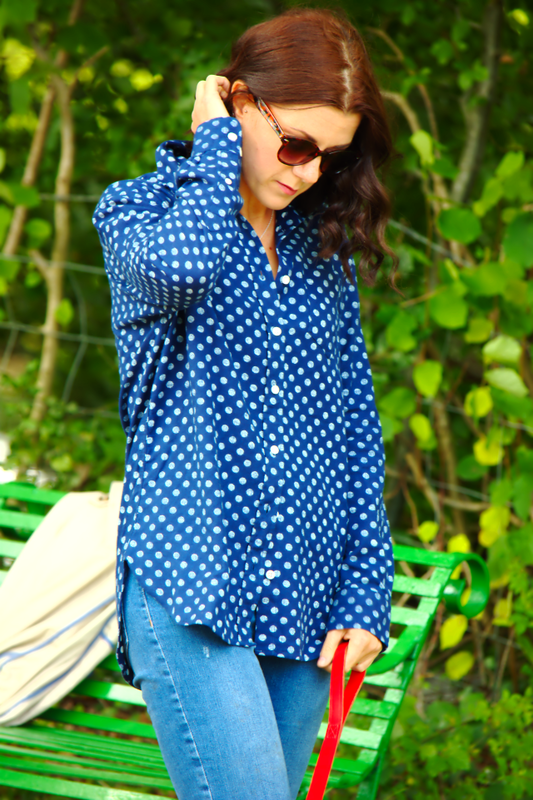 This is the ex-boyfirend polka dot and I just love, love, love it. It’s slouchy but not sloppy, it sits beautifully close without being restrictive and has the right amount of oversized to still look good without looking like you’re actually wearing your ex boyfriends shirt. What I mean is that it doesn’t add inches on a women’s frame, which I think you’ll agree is something no lady wants. I find with some oversized garments they add pounds where there shouldn’t be. This has just that perfect cut that we all crave. I’ve written about my love for shirts many a time, but this one is now up there as a favourite. I like the idea of layering a white tshirt underneath and leaving it draped open with some boyfriend jeans. Or with some faux leather trousers and black boots.. Yep its shirt love! Your very own furry baby.. Yep, couldn’t be without this one. What are you Weekend Style Essentials? A trench like that is forever! Welcome back from your break! Its nice to take one now and again isn't it. And yes i totally agree, a trench is forever.. a complete keeper! I used to work in retail too, so I know what it is like not to have a weekend. To always be working when the rest of the world is playing, it's hard. LOVE your casual outfit. The top and trench are fabulous. it is hard isn't it! I am so grateful to not work weekends at this point in my life. Its the only time i really get to spend time with the kids now they're back ins school! 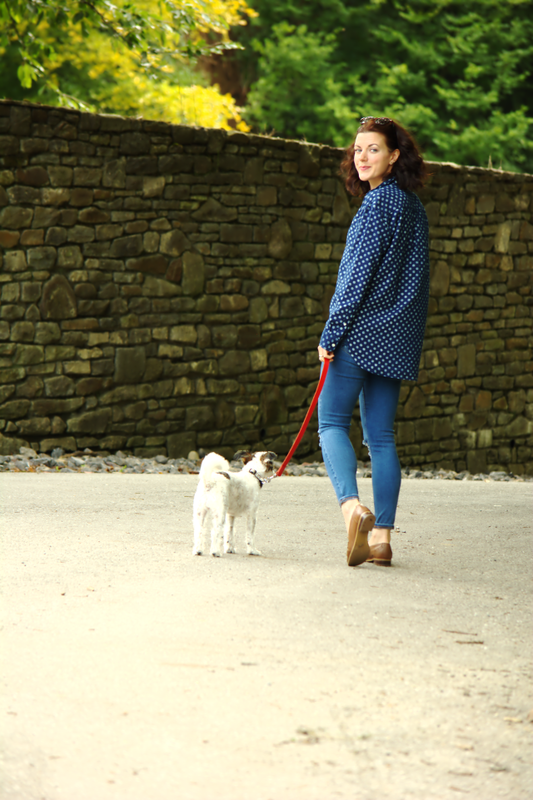 Thanks Amy, the shirt was an instant favourite, so so comfy and excellent quality! I love this weekend style look. 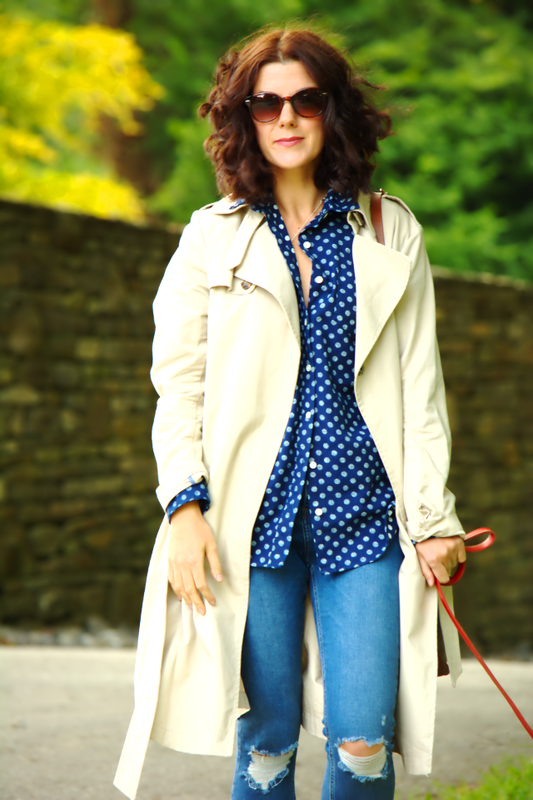 Relaxed, yet put together, and such a great trench! Thanks so much for stopping by, wishing you a wonderful week! Very smart look ! I love the trench and the top. 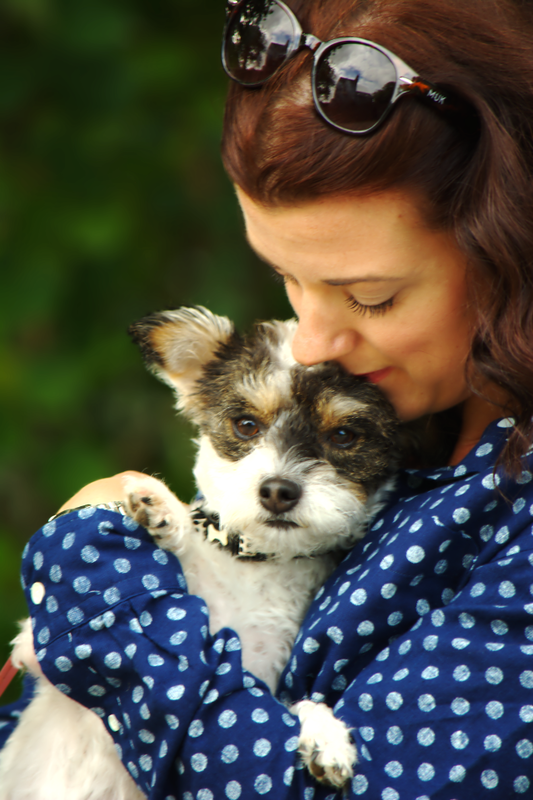 The photo of you and your pup up close if precious, you should have it framed!! I agree, It's nice to have some pieces that just work and make you feel amazing. 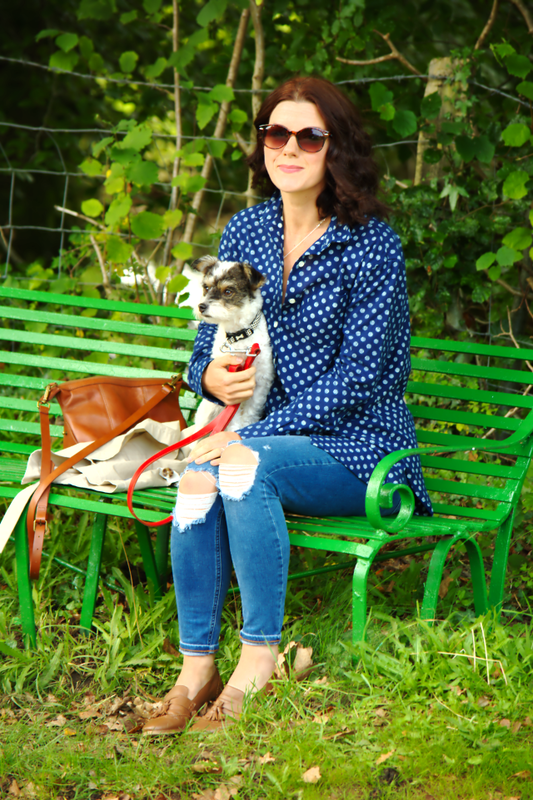 The trench is lovely, and of course I love seeing your pup!! I'm so with you on that last essential! Where would a girl be without her pup?! This look is so easy on the eye buy so chic and of course we all know what the most important accessory is. 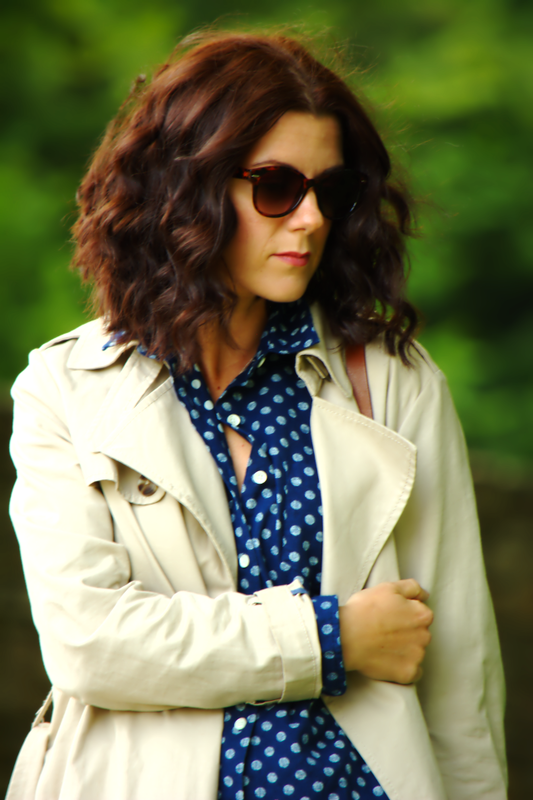 You can never go wrong with a classy and classic trench! What a gorgeous casual chic look! 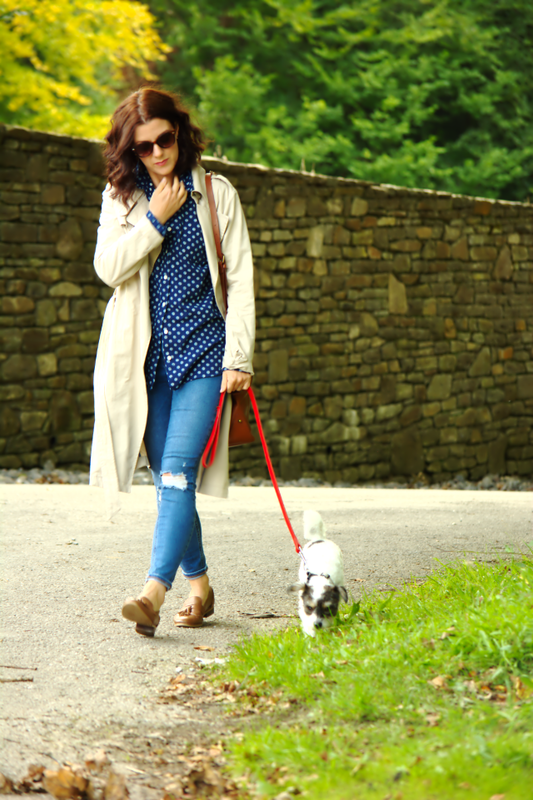 Obsessing over your trench style!